You are a great DJ and you made this event very special for my son. Thank you for being part of this special day for our family. Everyone loved the atmosphere which was set by your skill in the music. God bless. I am surprised no one else has commented but to bring you up to date per facebook ——all loved it and again your talent as a DJ had a lot to do with the ambiance. PS: Thanks so much for playing “Butterfly Kisses”, it really meant alot to both Jenica and her dad. Jenica has loved the song since she was 4 yrs. old. We had a wonderful celebration and you made it incredibly special. You certainly have the “Midas” touch and we all took notice. We have decided to adopt you officially into the Balboa family! Marly does quite a few fundraisers in town and she mentioned that she will be calling you in the future to assist, along with Balboa of course :). Thanks for everything and we will send some photos soon. Have a great trip home to Texas and we look forward to working together again soon. Thank you! Your professionalism and fun were just what we needed to round out our evening… and I’m pretty sure I saw you out there giving dancing lessons – that’s above and beyond the call of duty!! Thank You!! We really appreciated your performance at the bat mitzvah. I even saw a tag on your picture on one of maya’s facebook friends that read, “best DJ ever”. In that there were 8 more events within our group represented this year I am sure you will get more work as a result. you absolutely ROCK! Bart and I SO enjoyed meeting you and hanging with you and we wish we had more time together. What you did on the blog is amazing and outstanding. I see why people LOVE you! and we do to. I hope we get to wrk together lots in the near future and we wish you continued success, you deserve nothing but great things. You did an amazing job.Thank you soooo much. I love my wedding, love the music and now we in Kaui in paradise. Thank you so much for pictures and video . It look so good. Jay THANK you so much!!!! I didn’t take video so that is so amazing to have, you really made the party with your great , fun , positive, energy! Wow, what a great job you did. Thank you so much from our whole family. Alivia had the time of her life and it looked like a lot of the other kids did too. Love the photo! My friends are John and Susan Wintersteen. Susan told me that she hired you for an event in December. That’s great. I will be sure to tell David and Alexandra that you’ll see them in February. Thanks for sending us the link and posting us on your website. We have been hearing nothing but positive about the party from many staff, guests and even an email from one of our customers who was impressed with the staff’s joyful comments on how great the party was. J, thanks for doing such a fantastic job! From the extra lights that added to the ambiance, assisting with the raffles, to the great mix of music, the special song played to honor Jimbo, and even the song dedicated to his daughter, thank you for helping make our celebration for our employees such an incredible evening! We look forward to having you DJ for us again. Jimbo’s . . . Naturally! Thanks J! we had a great time and DJ Kevar was such a sport with all of my crazy friends. Our party was off the hook and thanks to you two the dance floor was poppin…BOOM. 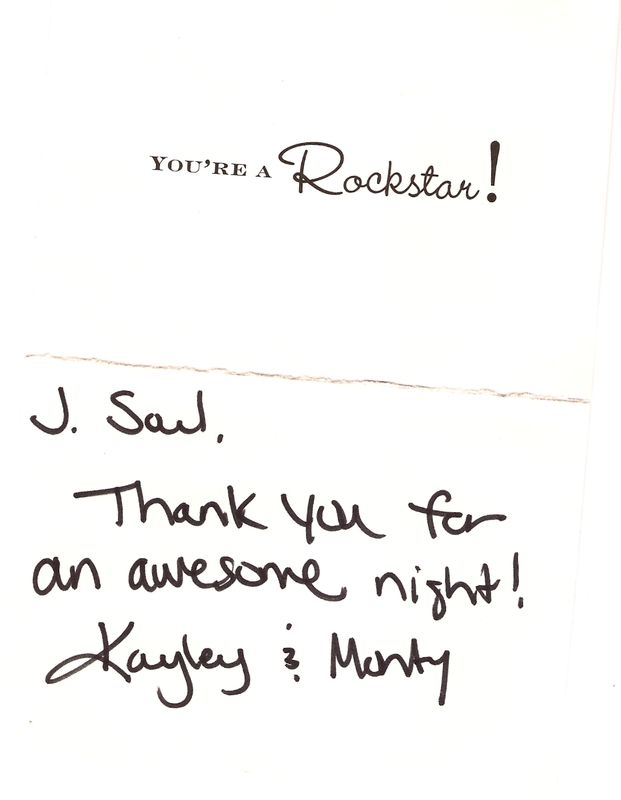 The guests loved Ayla and Matt and I were very impressed with your high tech system and lighting which made it even better. Once I get a liver transplant, we will plan another party and you will definitely be our DJ. Peace out! A BIG THANK YOU to you JSoul for this special memento. 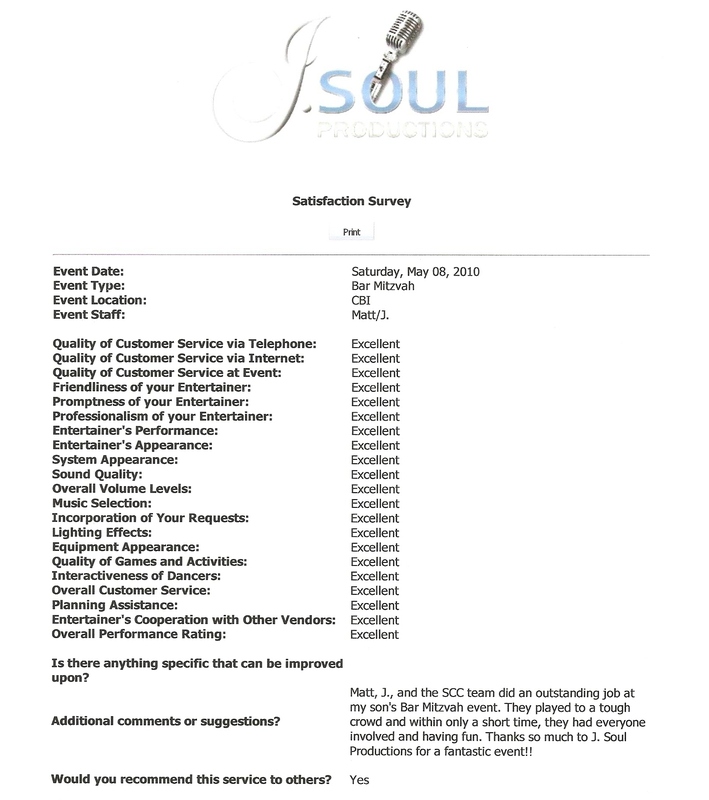 What a great job you did for us on our Special Day – everything from meeting with us ahead of time for our walk through to fulfilling every one of our entertainment needs and requests. There was so much extra stuff you did we didn&#039;t even ask for. You orchestrated everything extremely well for our wedding and the entire event went off without a hitch. It is our pleasure to recommend you to anyone who is planning an event. You prepared the perfect entertainment for us!! Thanks again for providing such a great set of music during our wedding. Everyone had a great time dancing and you did a great job of keeping everything going. It really was a fun wedding and you were a big part of its success. JSoul, you did an excellent job all night. Everyone has talked about how smoothly the dancing moved along. You managed to kick it up at just the right times to keep the entire dance floor crowded for the whole reception. And that is not easy to do…..thanks again, and again, and again!!! We cannot thank you enough! Its these moments that define our life together and we are happy to have shared it with you. 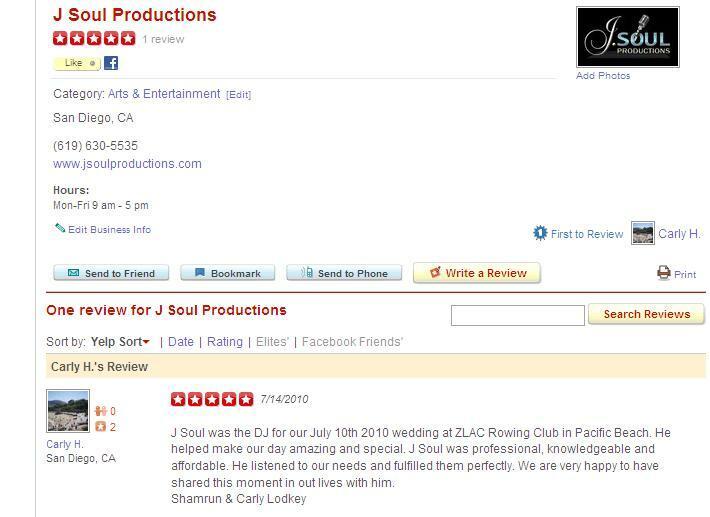 All of our guests are raving about the ceremony and reception and you played a major role in our wedding being a success. From Maxwells “Fortunate” leading off the ceremony to the final dance during the fireworks, the night was seamless. 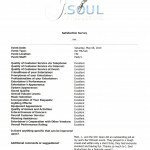 We loved how professional and personal you were with the entire process. We will recommend you to everyone! Thank you from the bottom of our hearts! We are going to name our first son Devereaux Soul Lodkey. We started a yelp page for you, it will take two days to post and you can update your info in the bio section. The blog was amazing, people are really enjoying watching the video. It would be a great way to expand your business by offering a short video for people to purchase from you. Dev did a great job shooting it. 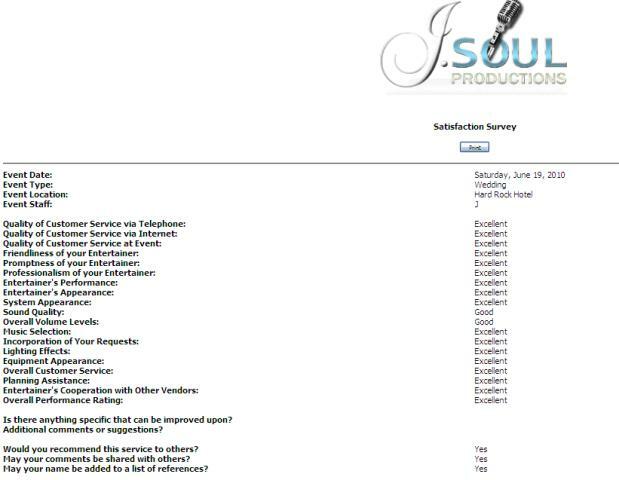 By offering it you could get interviews from guests, more close up shots and move throughout the crowd effortlessly. Again, I can’t thank you guys enough for a fantastic event! Danny had a blast and his friends will be talking about that party for years to come! The SCC group was amazing and added so much to the package. Lauren and Shannon were a huge hit with the boys, and Dev and Jordan worked it out for the girls. A perfect mix!! Looking forward to staying in touch and will surely send lots of referrals your way 🙂 Best of luck with J. 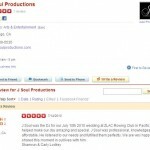 Soul Productions – looks like you are off to a great start and much deserved success! 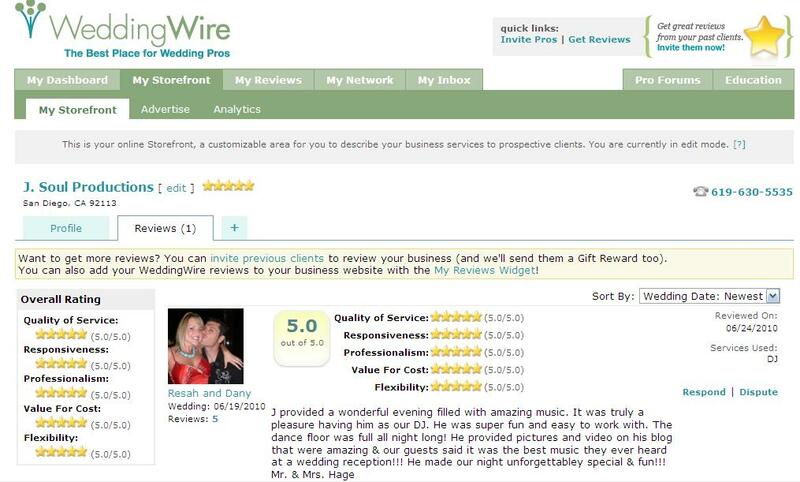 Thank you so much for working with us at the last minute to create a fantastic wedding reception. Although we didn’t get enough time to really enjoy your talents, it was enough to bring everyone out on the floor and create lifetime memories. Just a note of thanks to DJ, J. 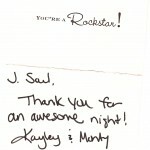 Soul, who played at my daughter’s wedding on Sept. 20, 2008, Dallas & Lisa Newberry (Lisa Howard). 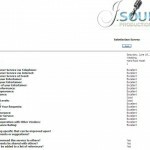 J was professional, personable, & just plain terrific! Please relay my thanks to him & hopefully we will see him again next year. Thank you so much! We had a great time on Saturday and you and your crew were fantastic! You really made Melanie’s celebration a big hit. Love the video too! Hey there..my new favorite DJ! Thank YOU! Saturday was a success. You rock! Hope to work with you soon..Take care!